A new build of Windows 10 is now available to Windows Insider on the fast ring. Windows 10 Build 10122 was released on May 21st, 2015, and all Windows 10 Pro Insider Preview installed and configured to receive builds faster will be automatically offered the download via Windows Update. Windows 10 Build 10122 is only available for fast ring users, thus there is no official standalone ISO images of Windows 10 Build 10122 on Windows Insider portal which could be downloaded to perform a clean install. For new Windows Insiders who want to install Windows 10, you must download and install Windows 10 Build 10074 ISO, and then update to Build 10122. Anyway, if you really want, many unofficial Windows 10 Build 10122 ISOs are now available for download after being built using the original ESD files released by Microsoft on Windows Update servers. Before installing Windows 10 Build 10122, be warned that it contains several bugs, including but not limited to Cortana’s speech troubles, frequent crashes of IE and Edge browser for users with AMD GPUs and occasional failures to upgrade with error 0x80070057 – 0x20007 that cause users’ PCs to roll back to the previously installed build. Despite the bugs, Windows 10 Build 10122 contains lots of improvements and enhancements. It also marked the beginning of final leg of Windows 10 development, where the new features addition are suspended (feature freeze, probably with the exception of Windows Hello which rumored to make the appearance in Windows 10 Build 10125) and there would be fewer big feature changes from build to build, and more tuning, tweaking, stabilizing, and polishing. Update to Windows 10 Build 10122 via Windows Update (if you don’t see the update, go to Advanced options to choose “Fast” as your preference for getting preview builds). Start and Continuum improvements: We’ve further refined the visual layout of Start by moving File Explorer and Settings to the bottom left of Start next to Power and All Apps for better symmetry. In addition, the ability to toggle between Start menu and Start screen has been moved to the new Start settings page under Personalization settings. We did this because on a vast set of devices like desktops, laptops or All–n-Ones, we expect users will pick the appropriate size (or just go with the default) for Start and stick with that – which makes having this button being present all the time unnecessary. We also saw that this button was creating confusion for users where many thought that is how they got to Tablet mode when all it did was resize Start. Moving the toggle to Start settings not only helps us remove this confusion, it also gave us the ability to further reduce the top chrome of Start to make it a bit sleeker. And remember for people on 2:1’s or tablets, Windows 10 will automatically resize Start to the appropriate size when you are in Tablet mode. You can enable the full screen start without being in Tablet mode by going to Settings > Personalization > Start. When you switch to Tablet mode, the left-hand pane is now collapsed and can be brought back out by clicking the icon at the top left. Start also now has larger tiles to better use the available space– similar to what was seen in Windows 8.1. Microsoft Edge: This build has the New Tab Page for Microsoft Edge. This page features a revamped layout, including top sites, featured apps and content from MSN. It’s designed to get you to your next destination on the web as quickly as possible. The content of the page can be lightly customized in Settings. We’ve also added a few other things to Microsoft Edge including InPrivate mode, the ability to pin websites to Start, history view, a new animated Reading View icon, and an audio indicator on tabs that have web pages making sounds or playing music. This build also includes the latest enhancements to the Chakra engine in Microsoft Edge, which now leads all 64-bit browsers in both Google’s Octane 2.0 benchmark and Apple’s Jet Stream benchmark, and introduces class-leading ECMAScript 6 implementation. You can read about these improvements in detail on the Microsoft Edge Dev Blog. Changes to how Windows 10 handles default apps: ‘Default apps’ refers to the way that Windows maps file types and protocols (like HTTP) to the Windows applications they open by default. For example, your favorite photo editor may be set as the default app for .JPG files, which means that when you double-click on a .JPG file in File Explorer, it opens in that photo editor. In Windows 8.1, Classic Windows applications (Win32) could invoke the prompt asking you to change your defaults, so you may have seen multiple prompts during install and after they launched. However, Windows Store apps could not invoke this prompt. Instead, a notification banner will appear after your apps are installed telling you that new apps are available and you would click on this banner to change your defaults. 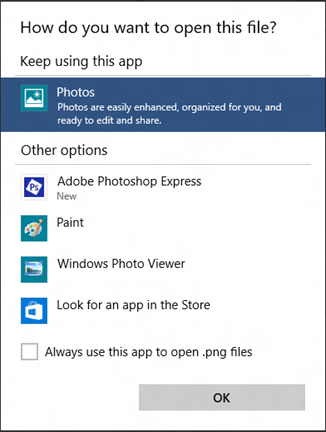 For example – if you install a new photo editor and go into File Explorer and double-click to open a JPG file – Windows will show you a prompt to change your default to the new app. So the prompt is shown in context when it matters, not randomly during setup or when an app is launched. Over time, as apps are updated to align with the new Windows 10 model for defaults, you shouldn’t see this dialog any more. And finally – for people who upgrade from Windows 7 or Windows 8.1, we’ll give you an opportunity to upgrade your defaults during initial set up to new Universal Windows apps that come as part of Windows 10. Fixed the visual glitch (“rectangle slivers”) that appears on Live Tiles on the Start menu with the new tile animation. In general, performance of the Start menu should be better in this build. Fixed a lot of the crashes with Microsoft Edge (Project Spartan) reported by Windows Insiders. Fixed the issue some people were seeing where their graphics driver fails to install from Windows Update with error code 80070103. This was happening because WU was trying to re-issue the driver. Fixed issues where fonts would render blurry on High DPI displays. Fixed some keyboard shortcuts in Microsoft Edge. Control + L or Alt + D shortcuts now got to the URL bar more reliably.